Now, as a dentist, I can only tell you that I know for sure when a patient flosses, and if they use the right technique. The picture is very clear (even though sometimes it’s a bloody mess. It’s a very clear bloody mess). We probably don’t have recent scientific studies to show that using toilet paper is beneficial, or that it keeps our… area… clean. But I think we all know that it does. Please, please tell me we all know that it does. Babies excluded. Not to draw too close a comparison between the fact that toilet paper and floss both clean things, but I hope my point is clear. Here’s the caveat – flossing is effective, but only if done properly. 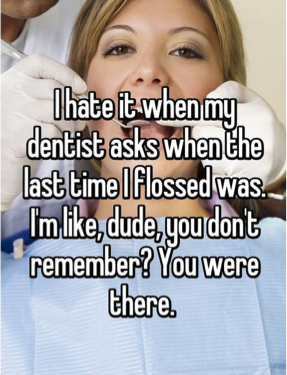 And no, that doesn’t mean letting your hygienist do the honors every 6 months. It means being taught the right way to floss (the dentist’s/hygienist’s job), and actually following through at home (your job). So what’s my final word? Please keep flossing (or start…), but make sure to do it the right way. Drop past the contact point between each set of teeth, and hug the neck of the teeth while sliding up and down. Be sure that every tooth gets a hug, because #everytoothmatters. They are sensitive and will get upset if they don’t get any love. And be gentle! It’s more about disrupting any sticky plaque on the tooth, not jamming it up there. If anything, I suspect this is an attempt by the dental profession to drum up more business for themselves. By all means, don’t floss. Ever! We’ll see you in the chair! Or, go rebel against the Associated Press, and tear a nice, long piece of floss off.